Some time ago, a poor man lived in Ramarajapuram village. He was an orphan. His daily routine was simple. Go to the Village Lake in the morning, take bath and sit on the Lord Shiva Temple steps. Devotees visiting the temple used to drop some coins and offerings like bananas, coconut pieces on which he fed himself. The uncommon nature with him was that he never spoke to anyone. Sitting calmly on the temple steps, he never asked for alms from anyone. He starved if the devotees gave nothing voluntarily. Days passed by. One day, the richest man of the village visited the temple along with his wife for offerings and prayers. The couple though very rich was not blessed with children. After praying the deity, the couple while walking out of the temple started distributing celestial offerings to the beggars on the temple steps. In this process, the rich man approached the poor man and gave him a banana. The poor man looked at the banana. For a second, he looked towards the sky and returned the banana to the rich man. Give this fruit to your wife and ask her to eat this. Soon you will be blessed with children." The words uttered by the poor man echoed in the rich man's ears like sweet music. Offering salutations, the rich man left the place along with his wife. On reaching home, the man gave the banana to his wife and explained what had happened while she was busy distributing fruits to the beggars and asked her to eat it. She received it with a divine feeling and consumed it. Until that time the couple were going all over the country visiting holy places and holy men seeking blessings for children. Within one year, the couple was blessed with a baby boy. 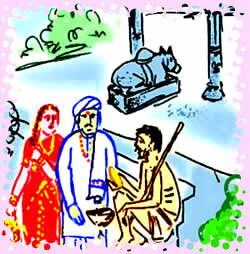 The couple thought of the poor man, took their child to him seeking blessings, and placed the child in front of him. The poor man opened his mouth for the second time, He is blessed with all the worldly riches. The couple was overwhelmed with joy and the rich man had an intense feeling that he was a saint. The rich man remembered all the riches he earned through unfair means and started wailing. The poor man asked him to leave for home. Returning home the rich man started thinking seriously on moral grounds. Finally, he decided that those riches were not important than the son and decided strongly to earn only through legal manner from then onwards. The next day, he returned all the property to the persons from whom he earned through illegal process and sighed with satisfaction. Stopping the narration, Bhethala asked, Hey King! Vikramaditya! How did the poor man got such a power to bless children to the rich man so suddenly? Is that the result of living on the sacrificed offerings and living on the temple steps? If you do not answer in spite of knowing your head will be blown to a thousand pieces. King Vikramaditya responded to Bhethala's question, Firstly, there is no evidence that the poor man has any divine powers. If that were the case, the villagers would have made him a Saint. The words of people who live without any selfish motives sometimes come true. Blessing children to the rich man is something similar. Vikramaditya continued, The rich man considered the poor man to be a Saint as he was blessed with a baby boy, at that time when he was vexed with life visiting holy places and holy men for the cause. The rich man had to change his style and standard of living, as he was bothered about his child. There is nothing beyond this to comprehend about the story you narrated.